When modifying the application to work with Citus, you’ll need a database to test against. Follow the instructions to set up a Single-Machine Cluster of your choice. Next dump a copy of the schema from your application’s original database and restore the schema in the new development database. The schema should include a distribution key (“tenant id”) in all tables you wish to distribute. Before pg_dumping the schema, be sure you have completed the step Prepare Source Tables for Migration from the previous section. 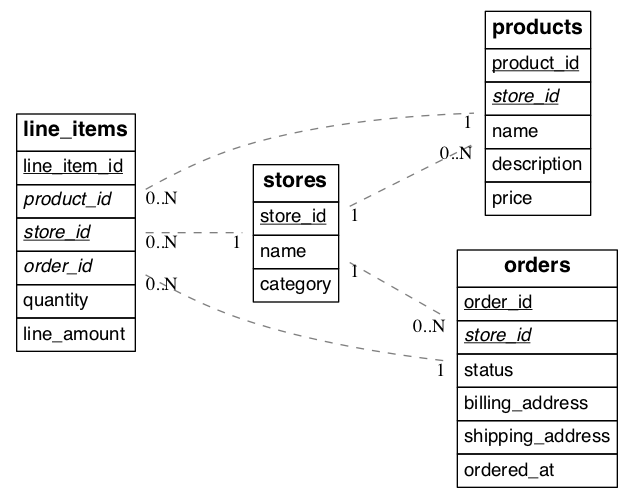 Once the distribution key is present on all appropriate tables, the application needs to include it in queries. The following steps should be done using a copy of the application running in a development environment, and testing against a Citus back-end. After the application is working with Citus we’ll see how to migrate production data from the source database into a real Citus cluster. Application code and any other ingestion processes that write to the tables should be updated to include the new columns. Running the application test suite against the modified schema on Citus is a good way to determine which areas of the code need to be modified. It’s a good idea to enable database logging. The logs can help uncover stray cross-shard queries in a multi-tenant app that should be converted to per-tenant queries. Cross-shard queries are supported, but in a multi-tenant application most queries should be targeted to a single node. For simple select, update, and delete queries this means that the where clause should filter by tenant id. Citus can then run these queries efficiently on a single node. It’s possible to use the libraries for database writes first (including data ingestion), and later for read queries. The activerecord-multi-tenant gem for instance has a write-only mode that will modify only the write queries. If you’re using a different ORM than those above, or doing multi-tenant queries more directly in SQL, follow these general principles. We’ll use our earlier example of the ecommerce application. The tenant id column is not just beneficial – but critical – for insert statements. Inserts must include a value for the tenant id column or else Citus will be unable to route the data to the correct shard and will raise an error. Clients should connect to Citus with SSL to protect information and prevent man-in-the-middle attacks. Citus Cloud, in fact, rejects unencrypted connections. To learn how to make an SSL connection see Connecting with SSL. With large and complex application code-bases, certain queries generated by the application can often be overlooked, and thus won’t have a tenant_id filter on them. Citus’ parallel executor will still execute these queries successfully, and so, during testing, these queries remain hidden since the application still works fine. However, if a query doesn’t contain the tenant_id filter, Citus’ executor will hit every shard in parallel, but only one will return any data. This consumes resources needlessly, and may exhibit itself as a problem only when one moves to a higher-throughput production environment. To prevent encountering such issues only after launching in production, one can set a config value to log queries which hit more than one shard. In a properly configured and migrated multi-tenant application, each query should only hit one shard at a time. Citus will then error out if it encounters queries which are going to hit more than one shard. Erroring out during testing allows the application developer to find and migrate such queries. The configuration parameter section has more info on supported values for this setting.